Not content just to let the Galaxy Note 8 make waves, Samsung is pushing out three new fitness minded wearables this holiday season: the Gear Icon X 2018 wireless earbuds, the Gear Sport smartwatch and the Gear Fit 2 Pro fitness band. Now none of these devices are exactly new (or attractive). What we’re really looking at are rehashes of earlier devices with a slightly widened focus of dressing your fitness needs for both land and in the water. But perhaps the biggest changes come thanks to Samsung’s new partnerships with companies such as Under Armor, Spotify and Speedo, which should breathe a little life into Samsung’s somewhat barren wearable app ecosystem. The Gear Sport and Gear Fit 2 Pro also come with continuous heart rate monitoring for all-day fitness tracking. 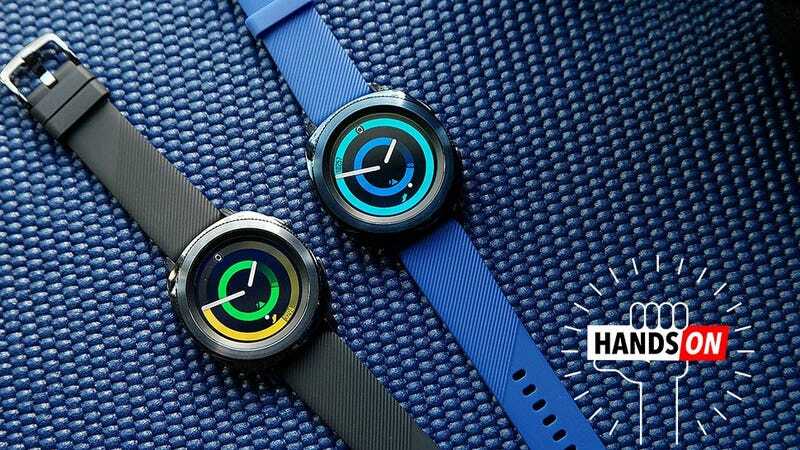 Starting with the Gear Sport, Samsung has blended much of the capabilities of its flagship Gear S3 smartwatch, with the cleaner lines and less bulky dimensions of the older Gear S2. In fact, I might even go so far as to say that this is what the Gear S3 should have been all along. You get a 1.2-inch AMOLED display and built-in GPS with easily swappable 20mm straps, but without the hyper-aggressive macho styling of the Gear S3. Five atmospheres equates to about 40 meters of water resistance, but I don’t know if I’d go SCUBA diving with it. To its credit, Samsung hasn’t messed around with the Gear Sport’s controls, which are still the best on any smartwatch to date thanks to its rotating bezel and the two buttons built into the right side of the device. Samsung has also included 4GB of built-in storage, so you can load it up with your own MP3s or take advantage of Spotify’s offline listening mode. And with new water-resistance that can withstand up to 5 atmospheres of pressure, there shouldn’t be any problems wearing the Gear Sport while swimming. Having two buttons and a rotating bezel make a huge impact on everyday usability. The Gear Sport can also be used to pay for things using NFC (but not magnetic stripe systems) via Samsung Pay, and also functions as a presentation tool and remote for the Gear VR headset. However, if those last two features really excited you, you are probably so invested in the Samsung ecosystem, you were already considering buying a Gear Sport anyways. The Gear Fit 2 Pro’s long and skinny screen and lighter body make it a better fit for more intense workouts than the Gear Sport. The Gear Fit 2 Pro features even less changes from the Gear Fit 2 than the Gear Sport from its predecessor. Its main changes are a more textured band and the same water-resistance that Gear Sport got. But hey, at least you can choose from red or red/black color options across two different sizes. Here are all of the IconX’s color options. Finally, we come to the Samsung’s revamped Gear IconX wireless earbuds, which come in pink, gray and black, but without the water-resistance of the two devices above. Despite looking almost identical to the original models, they are actually a bit lighter and sport significantly longer battery life that Samsung says should allow for 5 hours of streaming audio via your phone; or 6 hours if you play music loaded directly onto the IconX’s 4GB of onboard storage. Even with the included charging case, Samsung’s IconX earbuds are still pretty pocketable. Even though transferring songs to the earbuds over Bluetooth is a new feature for this model, being forced to do it one song at a time is not OK. But my biggest concern is that Samsung hasn’t done anything to improve the new IconX’s Bluetooth 4.2 wireless connection—which is the same as what you got on the old model. This caused audio to cut out while streaming music to the earbuds from your phone, especially in congested cities like New York. However, we’re going to need to perform some additional testing to see if that is still the case.